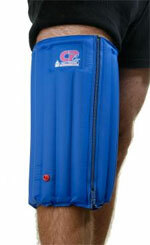 Provides cold plus compression therapy. No product works better to decrease swelling and promote healing. Zipper closure eliminates tapes & straps. Super strong urethane laminated to nylon outer chamber. Unique, SlowFlo™ Gel stays pliable when frozen. Gel is nontoxic & biodegradable.